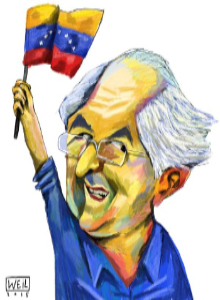 Veteran Venezuelan opposition leader Antonio Ledezma, under house arrest since 2015 for alleged coup plotting, escaped across the border to Colombia on Friday and later flew to Spain. With a 2018 presidential election looming, an array of major Venezuelan opposition figures are now in exile, detention or are barred from holding office. They say Maduro has turned Venezuela into a dictatorship, while the government accuses them of joining forces with a U.S.-led global plot to topple him. The Venezuelan Supreme Court justices appointed by the opposition have filed a complaint, in exile, with the International Criminal Court in The Hague, accusing President Nicolás Maduro’s government of crimes against humanity. The complaint accuses Maduro and nearly 60 other officials of a systematic persecution of dissent that turns any citizen who disagrees with his chavista brand of politics into an enemy of the state. Venezuela’s ousted chief prosecutor on Thursday asked the International Criminal Court to open an investigation into President Nicolas Maduro and four other senior officials for alleged crimes against humanity. Luisa Ortega visited the Hague-based court accompanied by aides carrying large files of papers. She said she turned over to the court more than 1,000 pieces of evidence including forensic reports, witness interviews and expert testimony linking security forces to more than 8,000 murders since 2015. For more than a decade, Alfredo Romero has been keeping tabs on people that Venezuela authorities have been doing their best to bury: political prisoners languishing in jail.The number this week: 342. Last March, Chief Justice Maikel Moreno shocked Venezuela when his Supreme Court nullified the powers of the National Assembly and transferred them to the 32-judge tribunal. Even in a country used to political upheaval, the decision triggered major protests, forcing Moreno to roll back much of the move three days later. Venezuela media law: ‘Threat to freedom of expression’? Human rights groups have raised concerns over a media law, passed earlier this month in Venezuela, that they say could stifle freedom of expression and criminalise social-media users opposed to President Nicolas Maduro’s government. The Venezuelan government passed a law that prohibits anyone from sharing content that «promotes fascism, intolerance or hate … on social media or digital platforms», under penalty of up to 20 years in prison.